What is the best place between Perth and Geraldton for a seaside holiday? Although the south-west of Western Australia is famous for its great surfing beaches, vineyards and gourmet delights, the region north of Perth also boasts some lovely, albeit small, seaside towns. Have you ever had a holiday at any of the small beach-side towns situated between Perth and Geraldton? Where did you stay and would you recommend it to others? In your opinion, what's the best and most attractive place along the Indian Ocean Drive, and why? What kinds of accommodation are available, and what is there to see and do? It would have to be Dongara. Pretty nice up there and there are dingoes you can see. Cervantes....Quiet, great camping area, just enough of everything. I would agree with Chipp -Cervantes. Guilderton is really pretty! 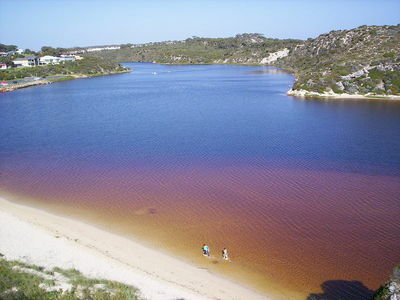 It's a tiny little hamlet situated at the mouth of the Moore River, and there's a lovely little camping ground there just metres from the beach, with motel units as well if you don't want to rough it too much. It's also not too far from Perth (about 45 mins north of Joondalup), so it's an easy day trip or weekend escape. The river provides lovely sheltered spots to swim and canoe...this place is an absolute gem! I love Guilderton...it's not too far from Perth, yet has a delightfully otherworldly sort of vibe. There's a lovely little caravan park there right near the beach and the mouth of the Moore River, with shady camping sites as well as a few comfortable self-contained cabins. Where can I buy Fair Trade goods in Perth? What are Perth's best diving schools? Where are Perth's best swimming holes? Where are the best spots in Perth for whale-watching? Best children's dance classes in Perth? What are Perth's best weekend escapes?